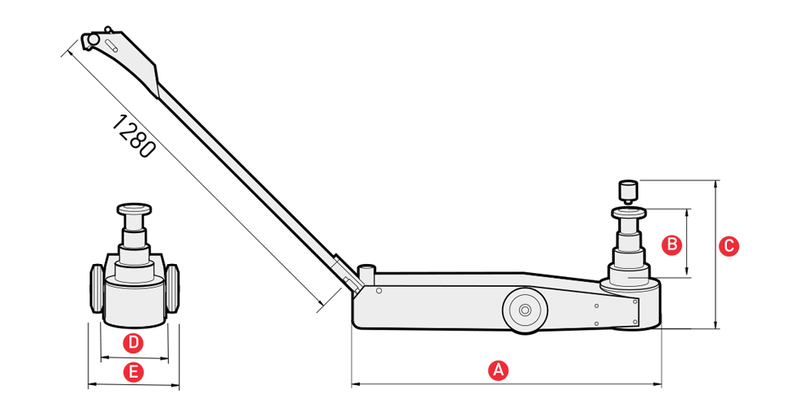 Hand lever locks in four different positions: horizontal, 45º, vertical or collapsed. Single control switch. Handly and easy to use. Rotating or retractable handle depending on models. A-5270. Workshop in-line air filter-regulator-lubricator. Optional. Its compact design integrates the oil tank in the frame structure to get a shorter chasis. Provides better manoeuvrability and ease of use. On the contrary, the longer chasis models provide a greater depth of access under the vehicle. High approach speed and efficient load elevation. The operator will always be in control of the operation even if the air supply is interrupted. Self-retracting ram descent eliminates manual lowering. Modular concept. The independent modular construction design-lifting block, valve unit, pump motor, release cylinder and tank -simplifies assembly and makes maintenance easier. For an optimal use of the jacks a working pressure of between 6 and 8 bars is recommended.